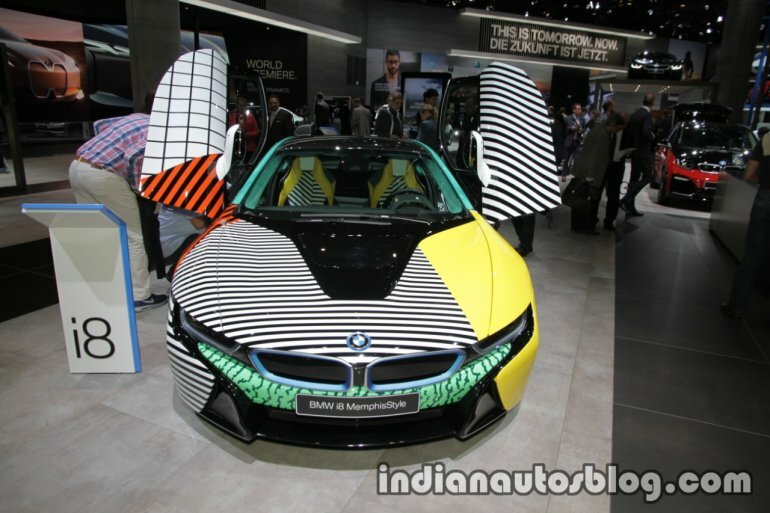 BMW has showcased the BMW i8 MemphisStyle Edition at the 2017 Frankfurt Motor Show. Here are the live images of the car from the event. Memphis is an artistic and cultural movement that revolutionised the world of design in the 1980s. Ettore Sottsass founded the Memphis Group in 1981. It gave rise to daring lines in furniture that was characterised by unusual materials and original graphic patterns. The style was clearly provocative and was inspired by movements like Art Deco (a style of visual arts) and its surprising geometrical shapes, Pop Art (pop culture art) with its bright colours and kitsch as a way to detach from the minimalist design of the 1970s. BMW i and Garage Italia Customs collaborated to create the BMW i8 MemphisStyle Edition. The car features exclusive BMW i MemphisStyle interior and exterior. Oblique, horizontal and vertical lines along with hypnotic patterns and vibrant colours are the main characteristics of the new livery which Garage Italia Customs have created. It moves away from the rigid standards of traditional design. However, every single element is perfectly aligned and the geometrical shapes flawlessly follow the curves of the bodywork of the car. There are eight layers of colour on the body, and it took them five weeks to meticulously finish the artwork. The different materials chosen for the upholstery (technical fabric, Alcantara and Foglizzo leather) are in strong contrasting chromatic matches. Bright colours, from orange to purple, green and yellow are the main features along with the tailored graphic patterns. There are no changes to the mechanical underpinnings of the car. Garage Italia Customs offers the Design to BMW i customers upon request.